Matty will be riding 12km for kids with disabilities at this year’s Spring Cycle. Hoping to raise $10,000 so ten kids just like him get the chance to ride a bike for the first time in their lives. “Matthew loves animals, dressing up as his favourite characters and going on the big rides at Wet ‘n Wild” says mum Susan. At 20 weeks pregnant Susan was told that her son Matthew had Spina Bifida and would have little to no ability in his legs. 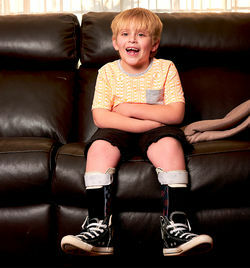 Within the first month of his life he endured countless surgeries and was fitted with Ankle Foot Orthotics (AFOs) to assist his growth and provide support for his feet and legs. He learnt to walk with the use of a walking frame and can now get around independently. His lack of balance and limited core strength however has meant riding a standard bike would not be possible. “He has little feeling in his feet and has found it extremely difficult to learn to ride a tricycle or bike as he doesn’t have the ability to keep his feet on the pedals and push down with his legs,” says Susan. Matthew has been invited to friend’s bike parties in the past and hasn’t been able to ride with them, which is a constant reminder of his disability and that he is not ‘the same’ as other kids. With his custom made Freedom Wheels bike he can join his friends and achieve his dream of learning to ride a bicycle. His new bike allows him to participate in activities that he wouldn’t have been able to do before and “be like the other kids”. It was thanks to the fundraising efforts of the students from Ashcroft High in Sydney’s South-West that Mattew was able to receive his Freedom Wheels bike. Now he wants to help other kids like him get their very own Freedom Wheels bike by riding 12km in the Spring Cycle and fundraising for TAD. He is excited to meet his heroes from Bondi Rescue, Harries, Kerrbox and Whippet who will also be riding the 12kms at Spring Cycle. With a strong support team including Member for Hornsby, Mr Matt Kean MP, experienced cyclists in Team TAD and the Bondi Rescue boys, Matty can’t wait for the day to come where he will get to ride his Freedom Wheels bike over the Harbour Bridge! There&apos;s still time to join Team TAD and Ride4Kids! Register now or call 1300 663 243 for more information.